Embedded collateral management solutions are attractive to firms looking to reduce total cost of ownership. London, 14 October 2015 – An embedded collateral management solution is integrated into another platform and is often offered as an optional module. Its rollout is likely to be faster and cheaper than that of a stand-alone solution, but it may not offer extensive functional support in all areas. Customizing it could be harder than customizing a stand-alone solution, but it will integrate well with its wider platform. 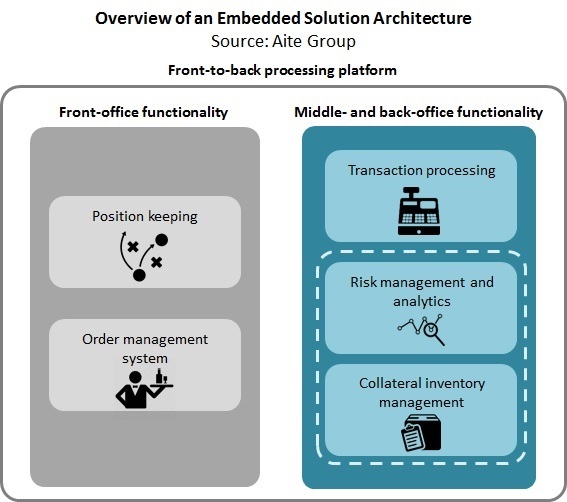 For some financial institutions, an embedded collateral management solution could be a hindrance. For others, though, it could be a huge help. This report, the final in a series of four on collateral management, examines the capabilities of embedded solution vendors serving the collateral management market. It is based on 2013, 2014, and 2015 Aite Group surveys conducted with leading market participants who have knowledge of collateral management. The report profiles these embedded solutions: BlackRock Solutions Aladdin, Calypso, Indus Valley Partners Treasury, Misys FusionCapital, Misys FusionInvest, SimCorp Dimension, and SS&C Lightning. This 38-page Impact Report contains 20 figures and three tables. Clients of Aite Group’s Institutional Securities & Investments service can download this report.